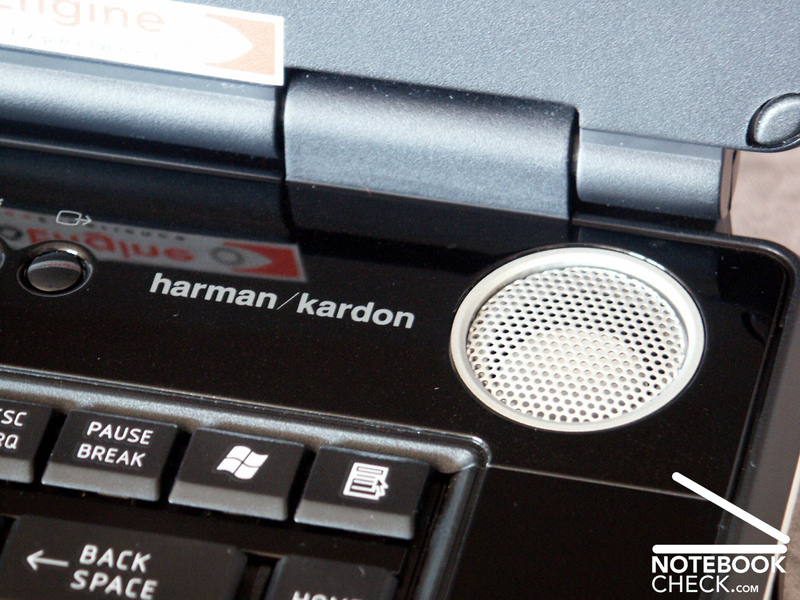 The implemented Harman/Kardon boxes are integrated in the case design by visible resonance accentuations. By right! A clean sound and good basses speak for itself. 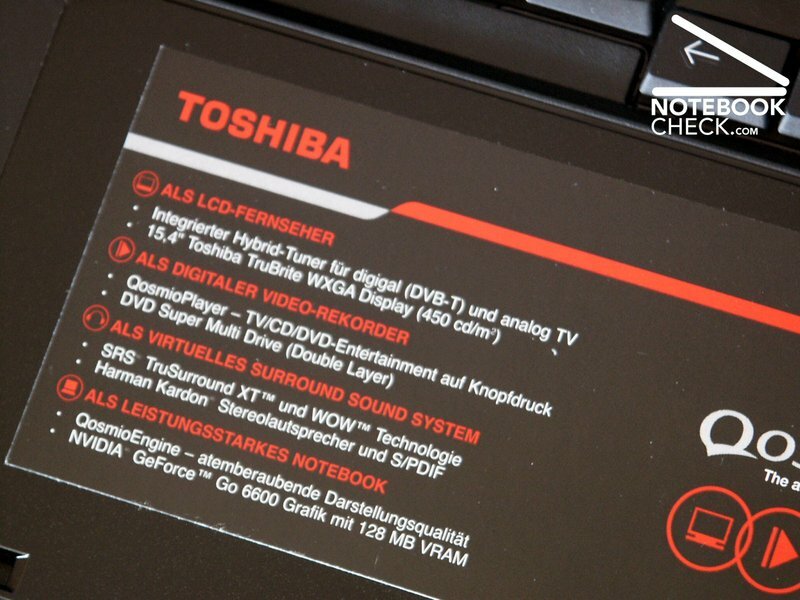 In addition the Toshiba Qosmio F20 offers SRS Trusurround XT and WOW technology and got a set of setting possibilities for the sound creation. In the Idle mode the fan is principally out of operation. 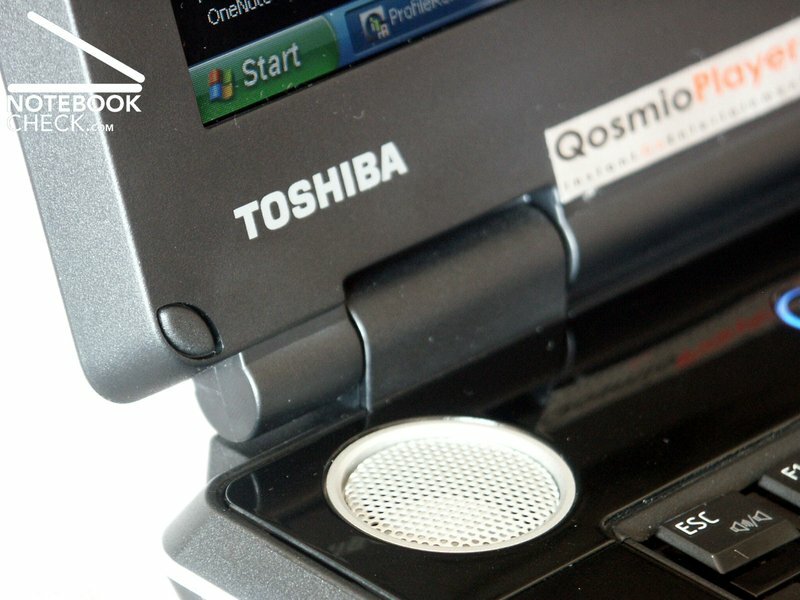 Then the Toshiba Qosmio F20 runs with a pleasant volume of 33,6 dB. If the requirements rise, the fan switches itself rapidly on and rises relatively fast and steplessly up to a maximally measured volume of 43,9 DB, but regulates itself rapidly back again. 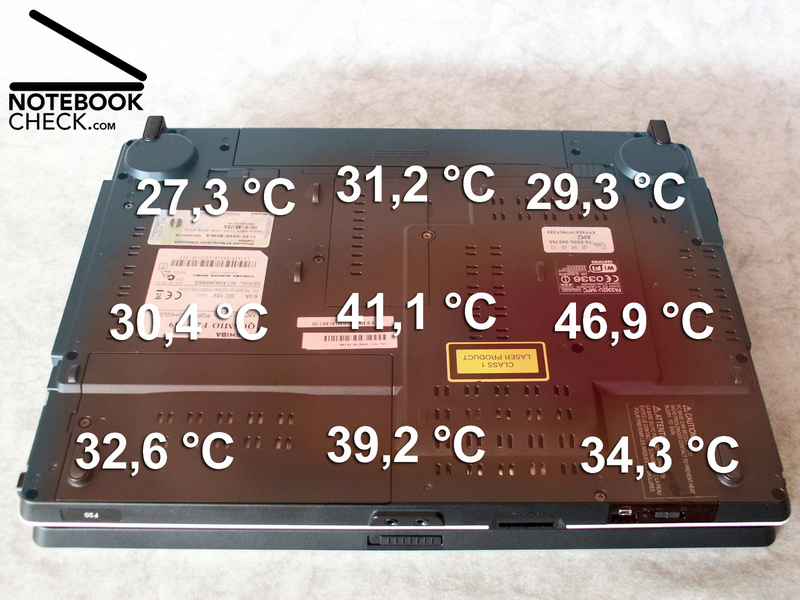 The DVD drive assembly remains decently in the background with maximally measured 41.3 dB. The diagram of the color representation shows a good positioning of the green and red curves and the usual deviation of the blue curve. This results in a rather warm color representation (red colours dominate). Nevertheless the image is very well. In the Pixperan readability-test we could achieve level 6, the creation of image diffusity is inconspicuous for a notebook TFT display. Also the viewing angle stability of the display is very good both in the horizontal and in the vertical range. 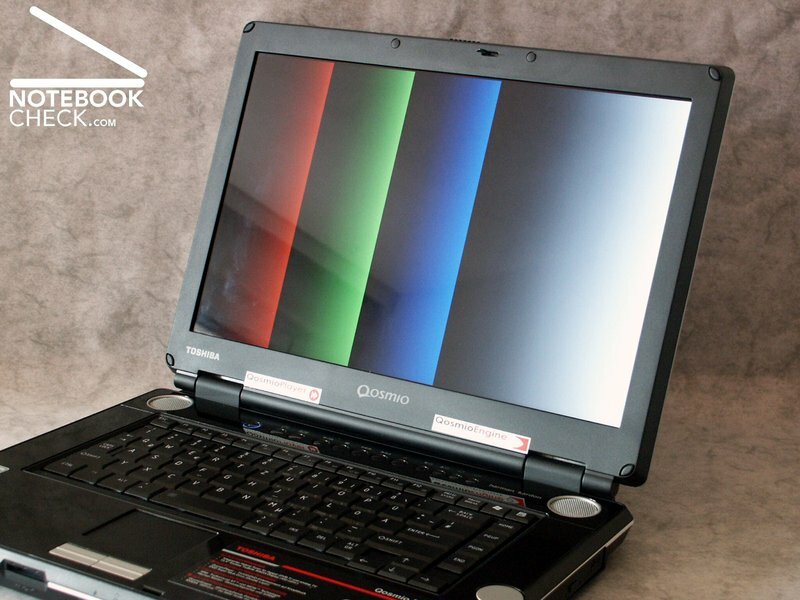 The colors and the brightness remain constant for a long time during a change of the viewing angle. 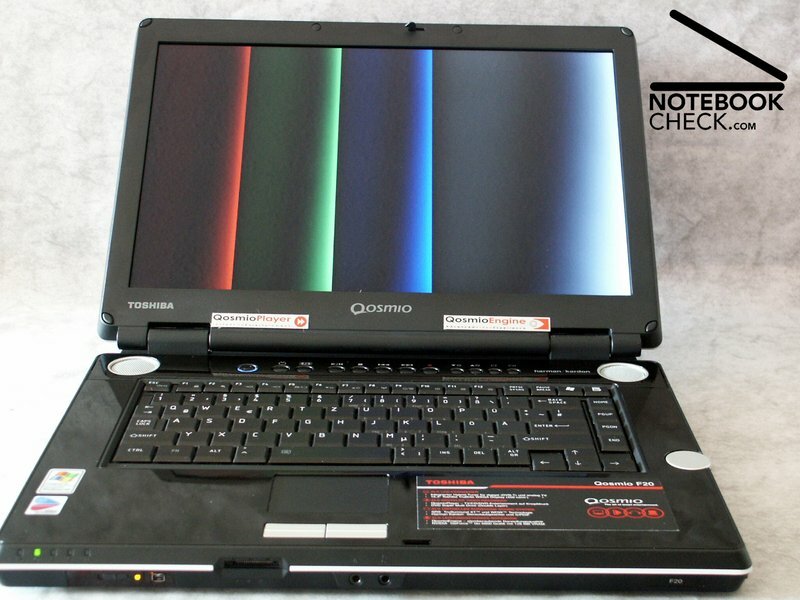 Depending on the position of the light source(s) reflections may occur due to the display. Without any doubt the Toshiba Qosmio F20 is an excellent multimedia notebook. The features, which are offered for this purpose are for example good speakers, a lot of multimedia keys and a brilliant display. 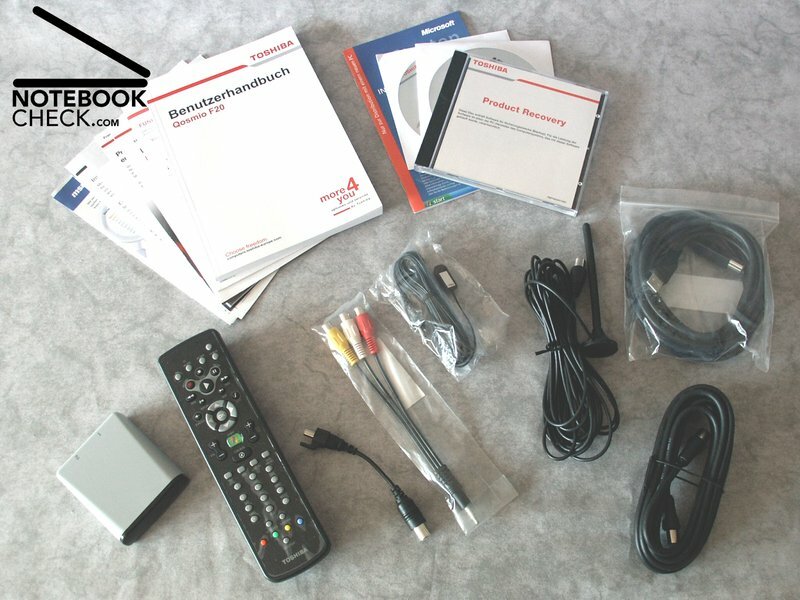 A further important aspect is the integrated DVB-T/analogue TV Tuner, included antenna and a remote control. The quality of workmanship is ok except a few crunching noises. We were pleased by the shining painted surface of the case, even if it will be covered by numerous finger marks within a short period of time. The technical basic equipment with Pentium M 750 and Geforce Go 6600 offers a solid performance in current games and applications, and still places a purchasable alternative to core duo and X1xxx video cards. 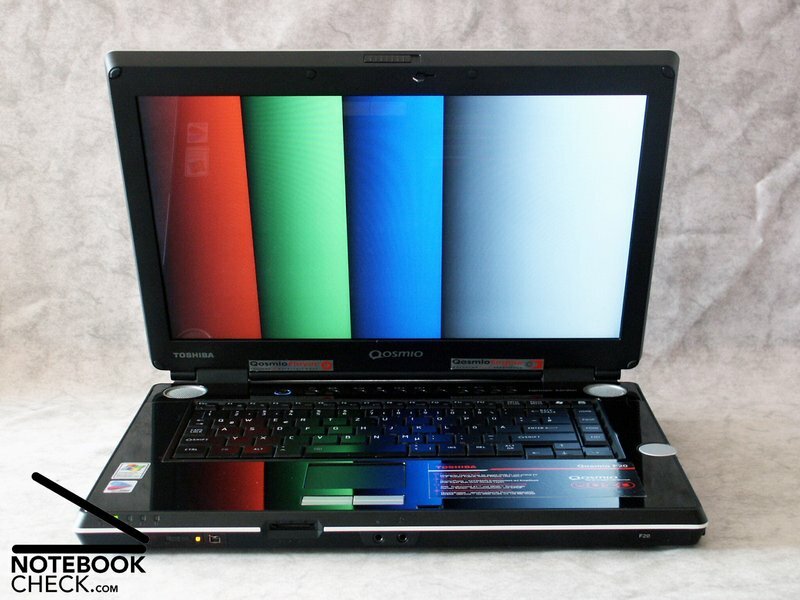 If one merges televisions, video recorder and radio with a notebook of average performance and pays attention to quality and design, one receives the Toshiba Qosmio F20. 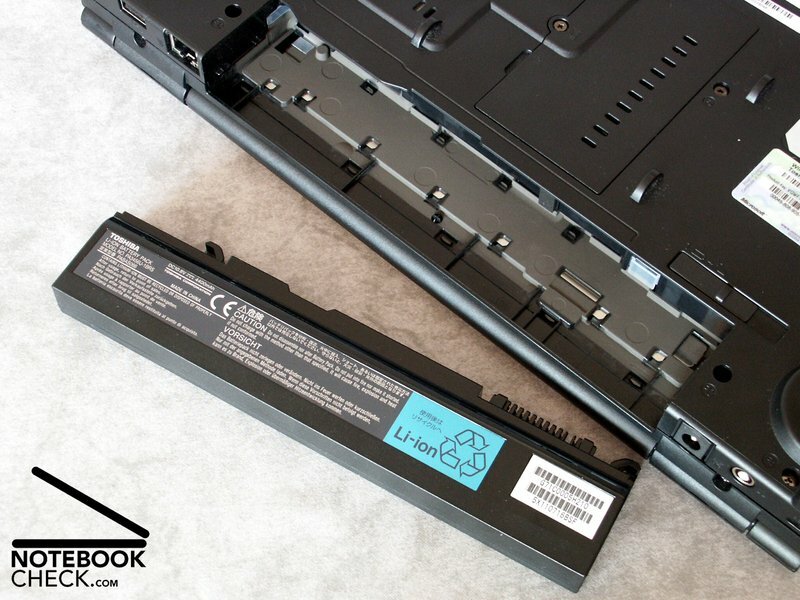 Despite the 15.4 inch widescreen display with good 424.8 cd/m² and an attractive performance by Pentium M 750 and Geforce 6600 Go, the battery runtimes of the Qosmio F20 are pleasing. The running times could be somewhat short during the DVD representation with maximum brightness. 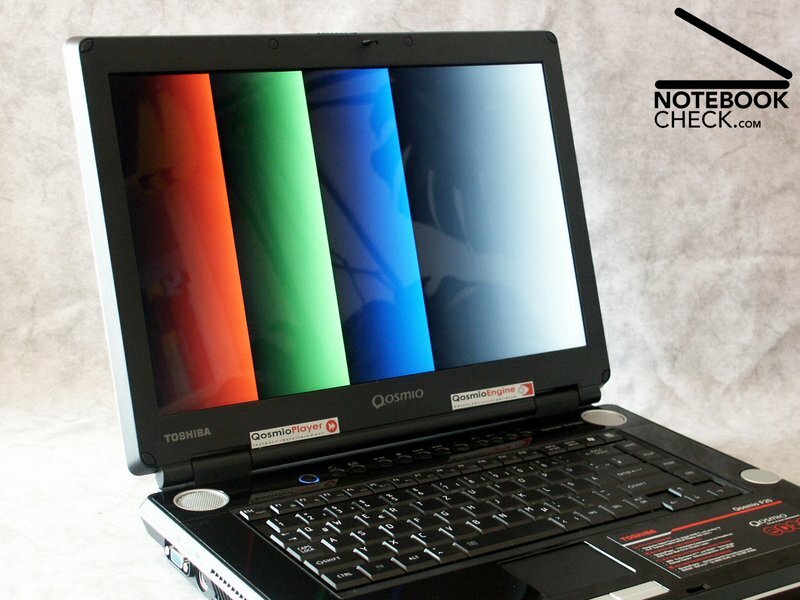 The Pentium M750 1.86 GHz and the Nvidia Geforce Go 6600 do not cause any surprises. 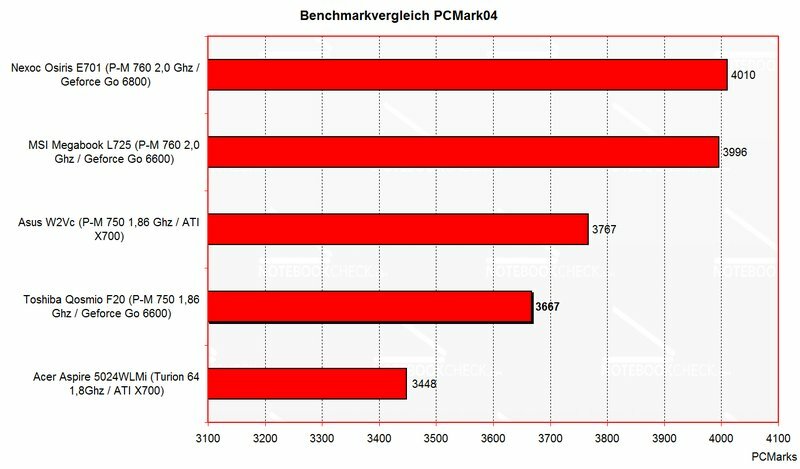 All benchmarks result are as expected. There is sufficient performance for current games, in the future there could be a lack of performance. 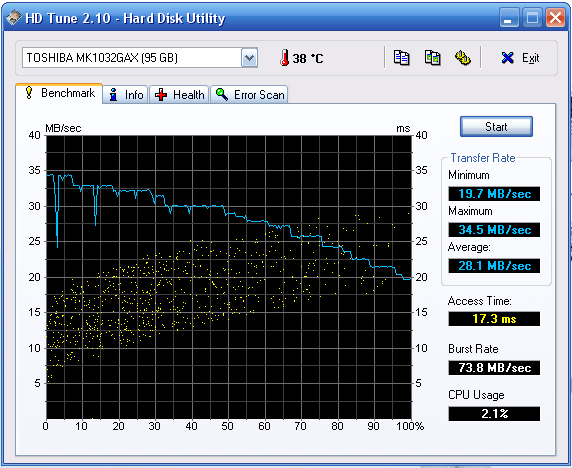 The HDTune benchmark test of the hard disk (Toshiba MK1032GAX) showed better results than the average tesed harddrive. 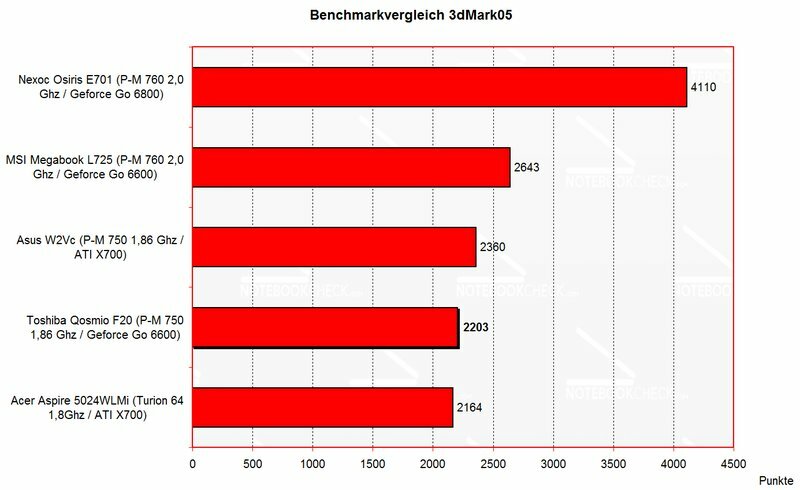 The time demo benchmark (Four.DM_68) resulted in 308.4 fps. 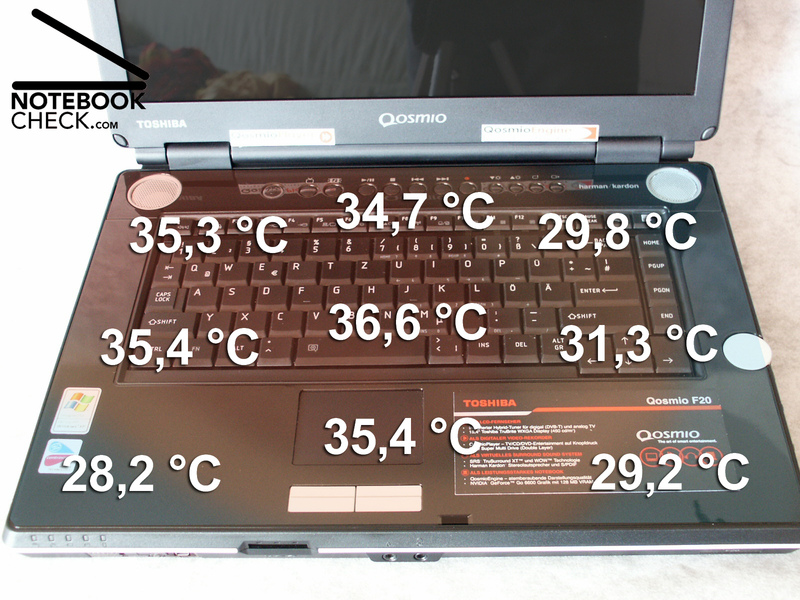 The warming up of the laptop is tolerable at the top (maximally 36,6°C). 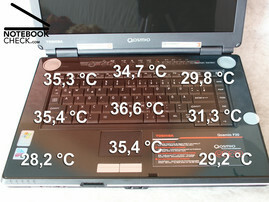 At the bottom clearly higher temperatures are possible in the range of the ventilator (46,9°C). The lower surface is highly perforated, which allows a good aeration and skillfully prevents from a blocking of a single opening. The display showed an extremely strong illumination. 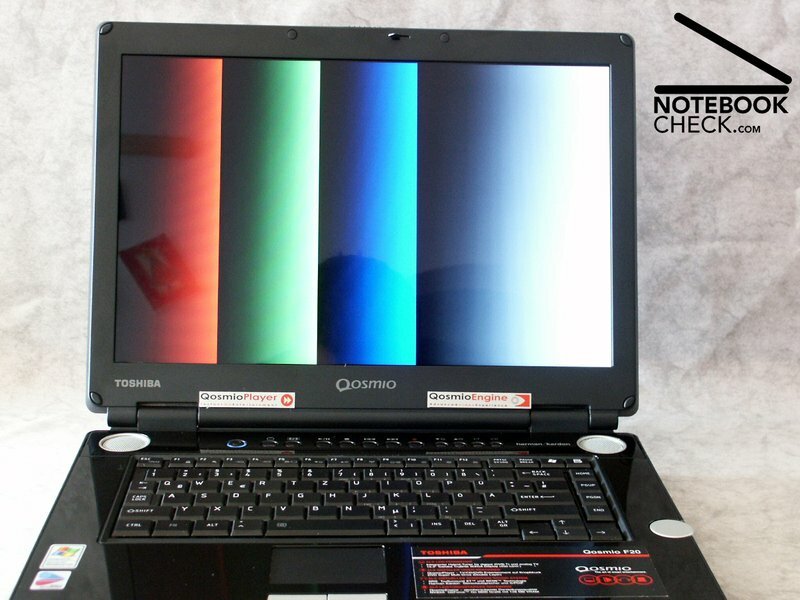 In addition a good viewing angle stability, but also 2 pixel errors were detected. The "TruBrite" WXGA TFT screen with a maximum resolution of 1280x800 pixel showed a maximum measured brightness of outstanding 424.8 cd/m²!! This is almost the value of 450cd/m², indicated by the manufacturer. The illumination amounted to average 80.2%. The brightness is sufficient for working at direct sun exposure. However with unfavorable light angles in the free environment the display reflects very strongly. The keys can be used very pleasantly and got a clear pressure point and a gentle clicking noise. According to my opinion the shape of the keys is somewhat too sharp-edged, which particularly can be felt during rapid writing. The Touchpad is inserted somewhat too far into the case. The same applies to the pertinent keys. 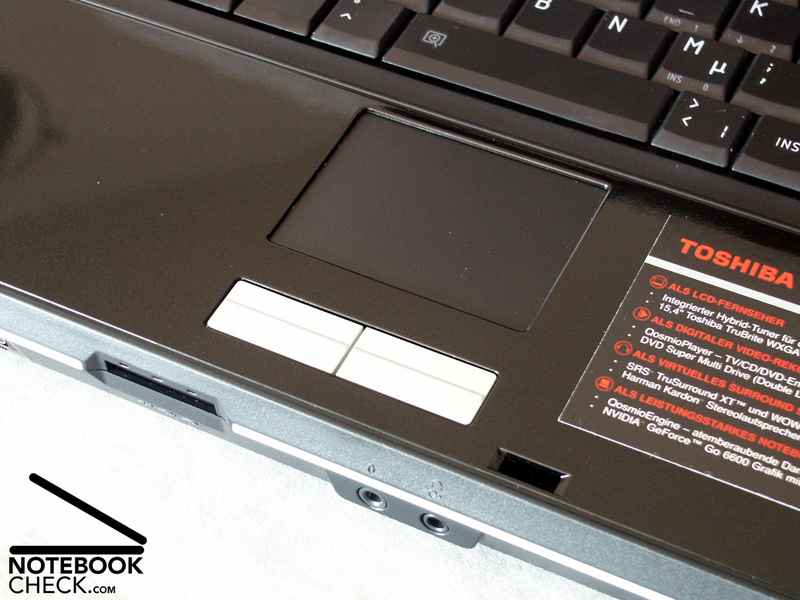 Nonetheless the touchpad can be used pleasantly, and responds well. The surface feels well and offers good sliding qualities. I think specially cool is the round rotary button for audio volume control. 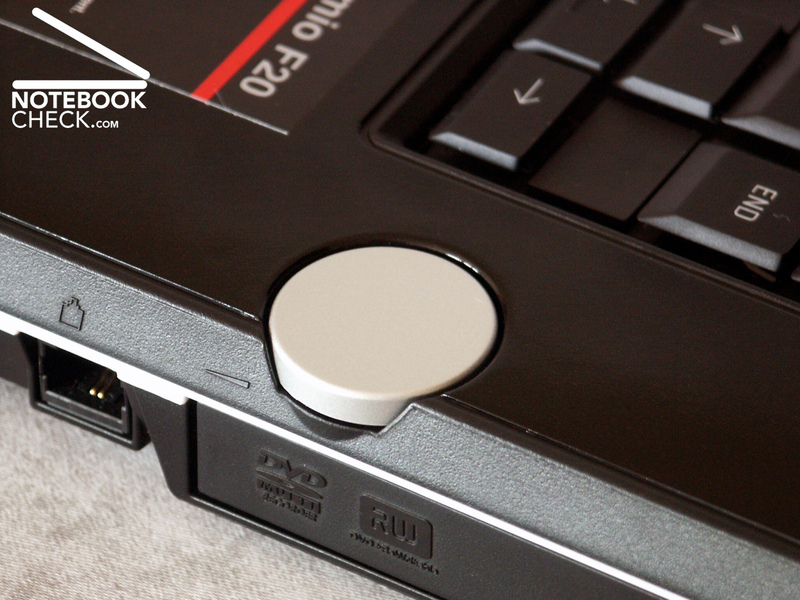 According to the design this button supports the positioning of the Qosmio F20 as a multimedia-notebook and exhibits special abilities according to sound and image representation. Small disadvantage: The WLAN slide switch at the front is somewhat wobbly. 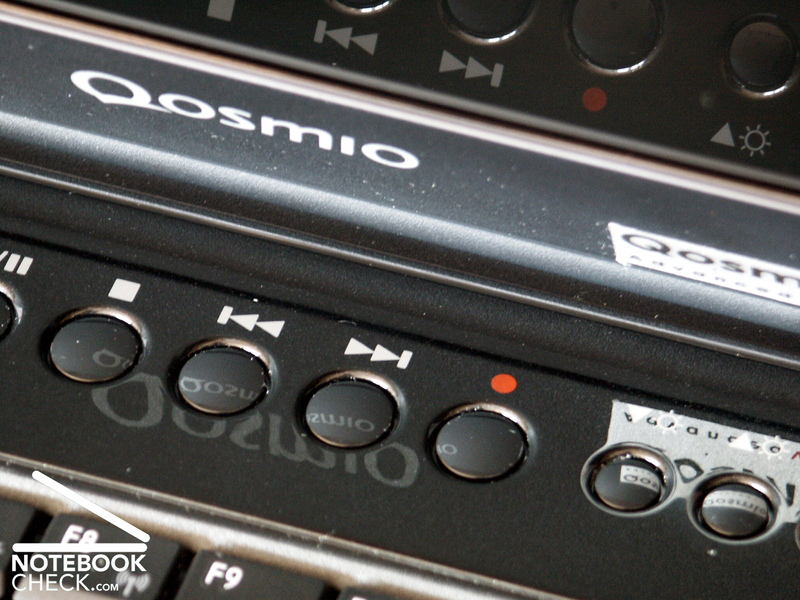 Concerning the design of the Qosmio F20 the two silver Harman/Kardon speakers and the silver turning wheel for audio volume control are noticeable. 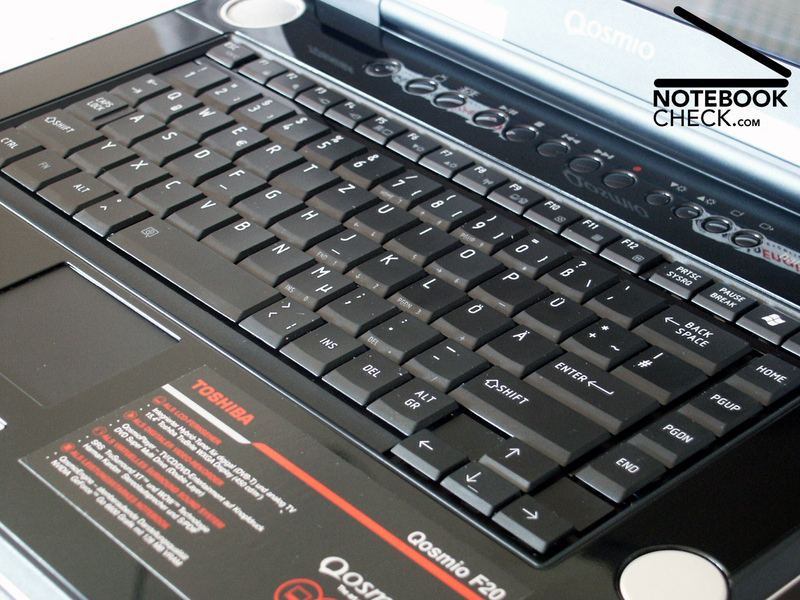 Also the high polish painted surface of the mobile computer and the numerous additional keys above the keyboard make the Qosmio exceptional. 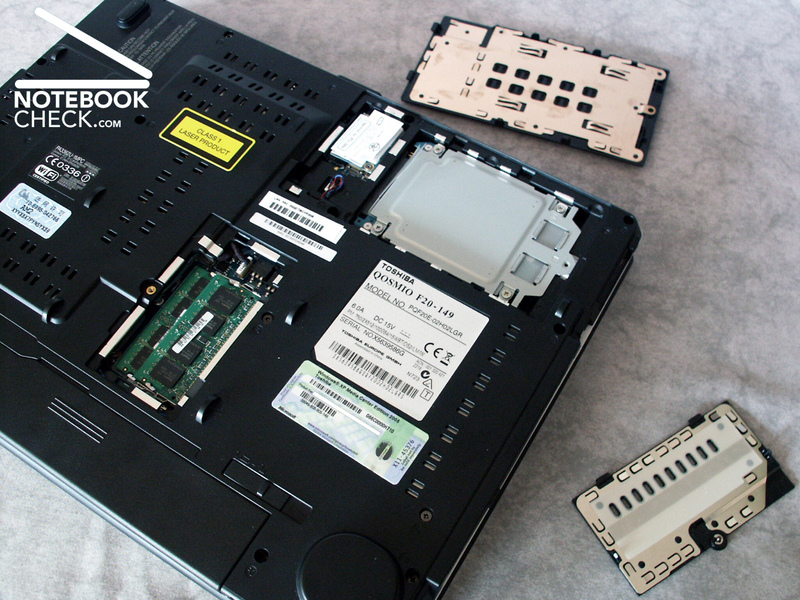 As most Toshiba notebooks the quality and workmanship is very good. The chassis consists completely of plastic. 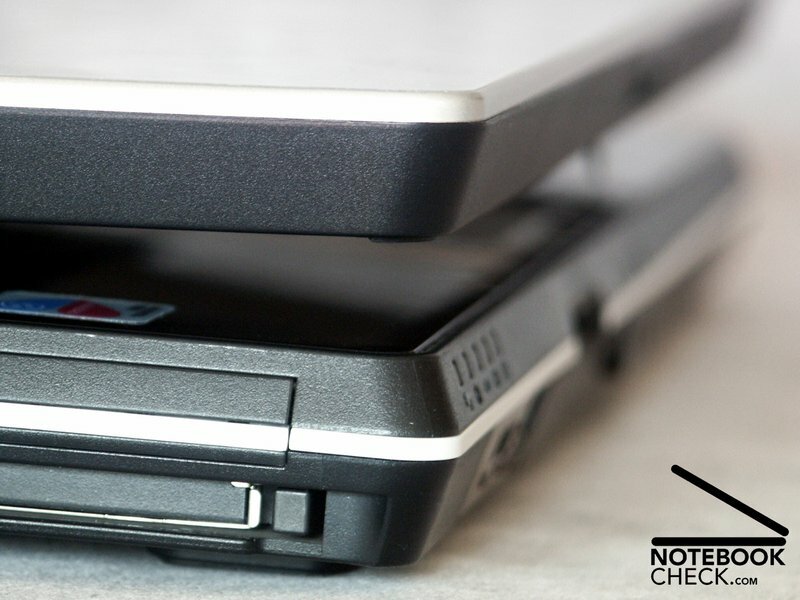 Nevertheless we could notice several crunching noises when pressing at the case of our tested laptop. 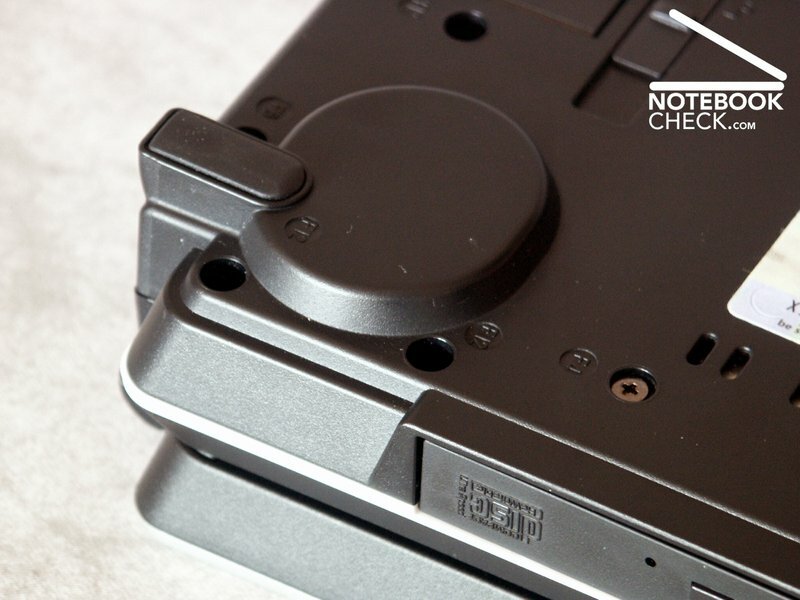 Within the range of the auxiliary keys the plastic tortioned noticeably. The display proved very stiff torsionally as it measures 16mm at the outside edges. Unfortunately the hinges of the Qosmio F20 permit a slight trembling noise. The connections are reasonably distributed, the monitor, network and power connections are positioned at left side within the rear range and/or at the back. In addition the highly flexible power cable was noticeable, which is good compared with conventional, partly much resisting cables. 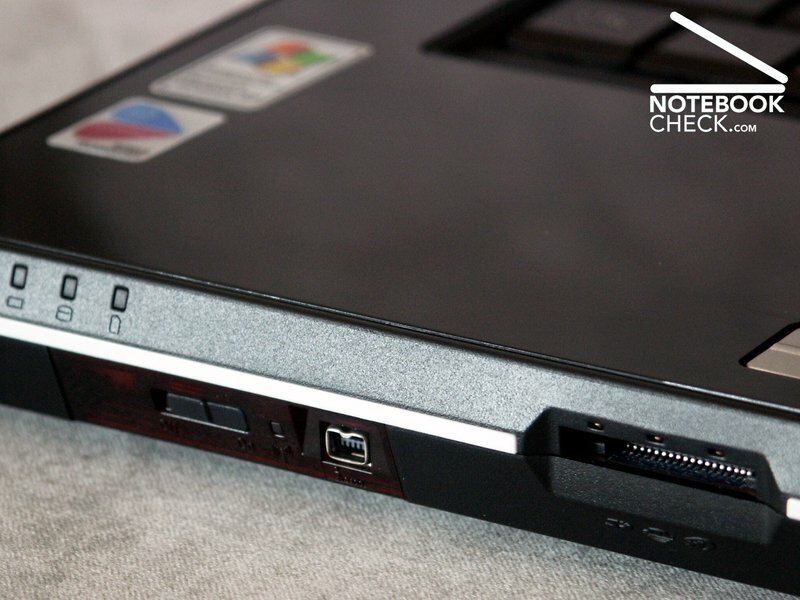 Are you searching for a pure multimedia laptop? 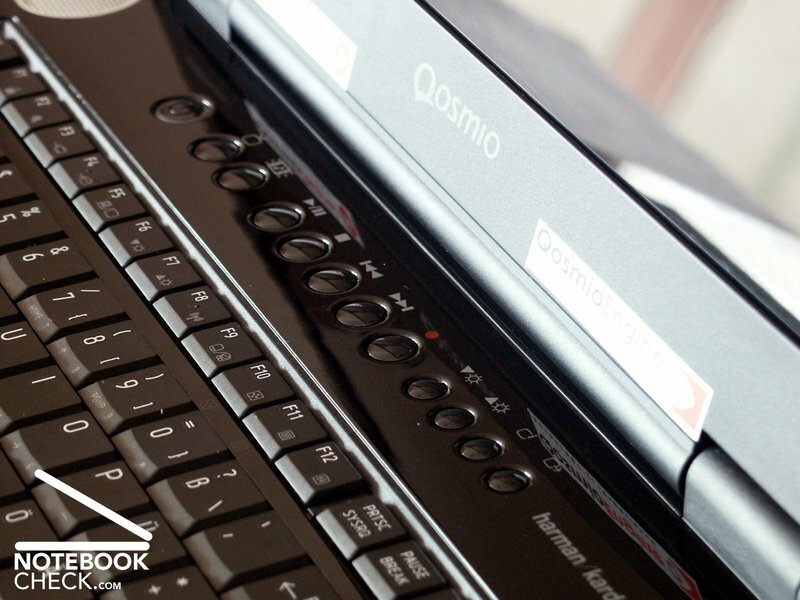 The Toshiba Qosmio F20 could be the best for you. It offers numerous features like a DVB-T/analogue tuner, Harman/Kardon speakers, SRS TruSuround XT technology and much more. 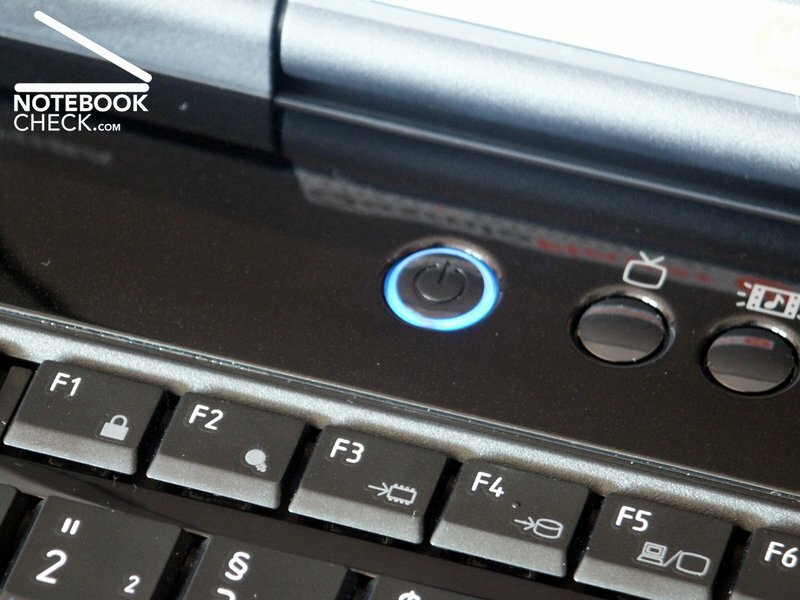 Equipped with a Pentium M 750 and a Nvidia Geforce 6600 Go, the F20 further offers sufficient power. 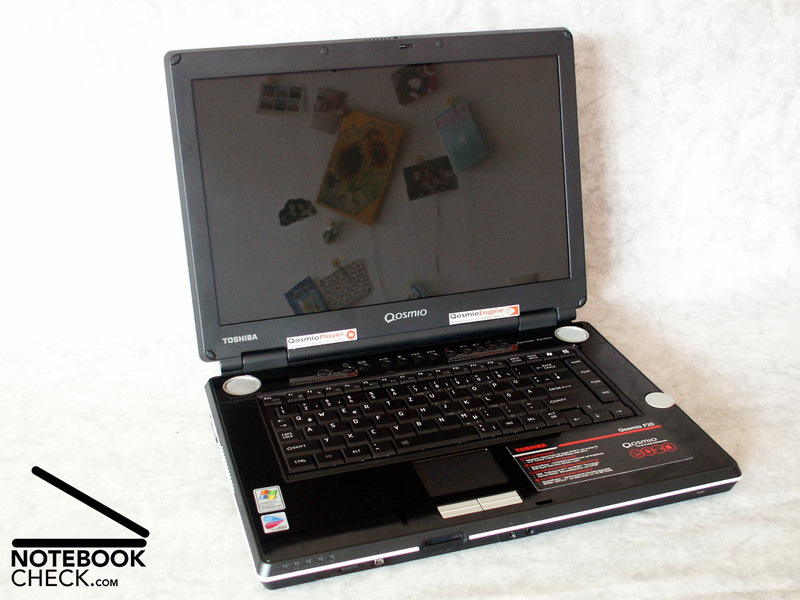 MSI Megabook 645: identical CPU and video card, 15.4"